Since our church became a Central Drop-Off Location for Operation Christmas Child several years ago, Sweet T and I spend Saturday mornings moving hundreds of cartons filled with thousands of shoebox gifts out of the Sunday school room and loading them into a 28-foot pup trailer. Our Saturday morning crew consists of a number of people: men, women, and children; individuals and families; who generously give of their time on what seems to always be a beautiful Fall Saturday morning, to help us complete this monumental task. They do it for the love of God and the promise of a donut, with joy and love, grunts and laughter. 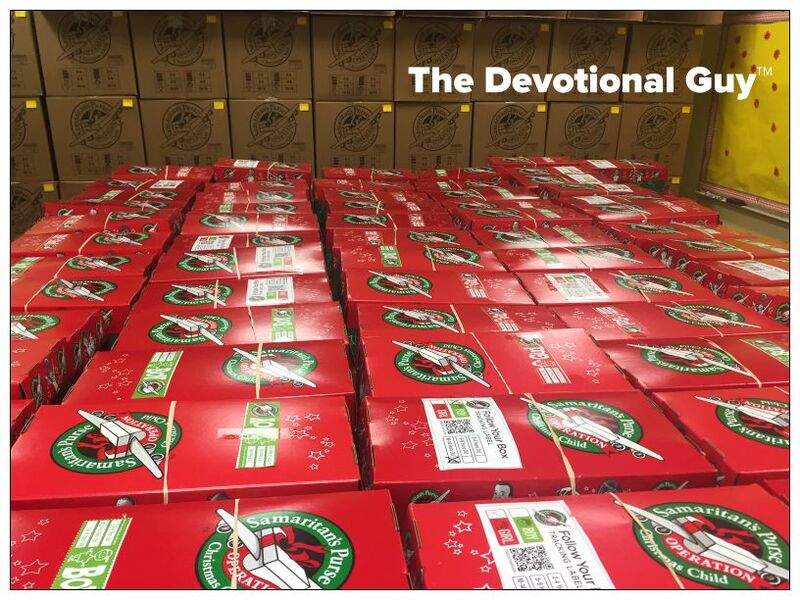 Every year during National Collection Week, Sweet T and I are overwhelmed by our numerous Operation Christmas Child volunteers who freely give of their time to help us complete the mission of this wonderful ministry. Every collection season we look forward to seeing familiar faces, many of them who have worked alongside us since we began this journey. Each year, we’re blessed by new volunteers who fall in love with the heart of this ministry that brings the love of Jesus to millions of children all around the globe. We are also incredibly blessed by our growing donor network, many who start out like Sweet T and I did back in 2008, packing a box or two only to multiply that number into hundreds and hundreds of love-filled, prayer-immersed shoebox gifts. Oh give thanks to the LORD; call upon his name; make known his deeds among the peoples. It is truly amazing to see God at work through the church, inside the four walls of brick and mortar, and outside the traditional church walls, in businesses, schools, small groups, and other community organizations. It’s been an incredible week so far and Sweet T and I find ourselves feeling very grateful, encouraged by our sea of ministry partners who answer the Lord’s call to deliver exceedingly and abundantly more than we could ever imagine.